Preheat oven to 150C. 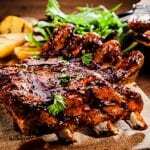 Mix the hoisin, brown sugar, oyster sauce, garlic, ginger, juice and lime together and pour over the ribs in a large baking dish. Cover with foil and cook for 1 hour. Allow to cool. Grill over medium-high coals until golden and sticky, basting with the leftover sauce. Serve with fresh coriander and chilli on the side.